My wife and children are careful to correct anyone who calls me a native of California. Seventh- and eighth-generation Californians, respectively, they view me as a greenhorn just off the boat. Although I’m Chicago-born, I have lived in Palo Alto in the midst of Silicon Valley since I was 8 years old, before it was Silicon Valley, when it was still known as the Valley of Heart’s Delight. Back then, two-thirds of the nation’s apricots were grown here and San Jose, now one of the 10 largest cities in the United States, was a sleepy canning town. Still, while I was growing up, I did have some clues as to the wondrous things that were happening hereabouts. My dad worked on the first videotape recorders as an engineer at Ampex. I went to high school with the children of Hewlett and Packard. Bob Noyce at Intel was developing the microprocessor, Doug Engelbart was putting together a wooden prototype of the computer mouse, and Bob Metcalf and Dave Boggs at Xerox PARC were coming up with the Ethernet networking protocols. Today these achievements make up whole chapters of the Valley’s creation story. Something else was going on back then that I didn’t notice at all. Over at the Stanford Linear Accelerator Center (SLAC), physicists were discovering what our universe is made of. You’ve seen that picture of an atom with spheres clustered in the middle representing neutrons and protons and electrons whirling in orbit around them? It’s employed as an icon to symbolize cutting-edge science. But everything in the picture is wrong. Protons and neutrons are not balls; they’re made up of three particles called quarks (which come in six flavors: up, down, top, bottom, strange, and beauty). I know your new Mac, PC, or iPhone with the incredible user interface and fast graphics accelerator chip is cool. And for all I know, you thank the gods of Silicon Valley everyday for developing its underlying technology. But is it cooler than the building blocks of the universe, the leftovers from the Big Bang? I took a tour of the building at SLAC where quarks were discovered four decades ago. And you know what? It’s a warehouse. Thomas Edison’s lab is a national historical park. The Wright Brothers’ Kitty Hawk is a national memorial. But in the midst of Silicon Valley, the very place where scientists identified key building blocks of the universe is filled with dusty boxes. What kind of people made that discovery? Shouldn’t they be celebrated? Maybe, but in a work of fiction, cautiously. As a thriller writer, my main job is to entertain. But I figured I could sneak in a fictionalized story of the discovery of quarks. Fun physics? Sure. What if someone were zapped by an electron beam moving at more than 99 percent of the speed of light? The key was focusing not on the particles, but on the people. So how could I tell the story in compelling fashion? Nothing makes even a crotchety man like me a feminist faster than having daughters. And I have three of them. Somewhere along the way, I picked up a book on Rosalind Franklin. Her work provided the key that opened the door to the discovery of the structure of DNA. But James Watson, who won a Nobel Prize for this discovery, disses her badly in his book Double Helix. He wrote: “The real problem, then, was Rosy. The thought could not be avoided that the best home for a feminist was in another person’s lab.” In fact, Dr. Franklin was one of the top experimental scientists of the last century. Her lab colleague showed Watson an X-ray she had taken, and it was that picture that demonstrated to Watson the double helix topography of DNA. Franklin died at 37, never knowing the vital role her research had played in that discovery. Now there’s a story fraught with intrigue, personalities, and high stakes. I borrowed from the outlines of Rosalind Franklin’s life by giving Smasher’s protagonist, Ian Michaels, a great aunt who made a key discovery about quarks in the 1960s at SLAC. She died young and without the Nobel Prize her colleagues received. It falls to Ian to win her posthumous justice. I try not to be too preachy or didactic and focus on the plot, rather than the physics or the lessons learned. But injustice two generations old was not a big enough hook to hang a thriller on. 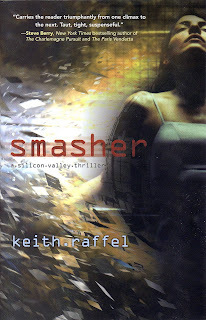 I also wanted to infuse Smasher with some of what I’d experienced--as a child and an entrepreneur--in Silicon Valley. At times, I wax nostalgic for the Eden-like Palo Alto of my youth where doors remained unlocked, cherry and apricot orchards abounded, children frolicked, and the sun always seemed to shine. Still, I wouldn’t go back to those days of yore. I’ll opt for 21st-century excitement every time. Palo Alto now sits at ground zero of the high-tech world. Hewlett-Packard and Facebook are headquartered here. Google is just to the south of us, Oracle a few miles to the north. Companies in the Valley consistently receive about a third of all the venture capital invested in the United States. Priests look to the Vatican, financial whizzes want to be in New York City, aspiring actors head to Hollywood. For entrepreneurs, the sun rises and sets in Silicon Valley. This is the major leagues, filled with smart players from all over the world. Too many novels to count have featured Rome, Manhattan, and Hollywood. A lot fewer have been based here in Silicon Valley. How the Valley operates reminds me of the scene in The Godfather where a gangster excuses a murder by saying, “It’s not personal, Sonny. It’s strictly business.” Here in the Valley, “it’s strictly business” justifies almost anything. If there’s a chance for an investor to extract some more shares of stock from the founder of a company, go ahead-- it’s business. If one corporate director hires a private investigator to spy on a fellow board member--well, that’s business, too. As the founder of a Valley company, I have lived with real-life drama. One Friday, for example, money arrived from a customer just 15 minutes before our payroll checks would have bounced. That disaster could have taken down the whole company. Now, Ian Michaels of Smasher is not me. He’s better looking, smarter, more resourceful, richer, and more attractive to women. But I wanted him to live some of the real-life drama of being an entrepreneur. In today’s harsh financial environment, good companies fail because venture capitalists lose their nerve or run out of money. The stakes are high. Certainly, in a fictional world, high enough to kill for. I had to use all of that in Smasher. It’s against this background that Smasher’s Eddie Frankson operates. He’s the CEO of Torii Networks and the second richest man in California. I’ve met some of the Valley’s biggest names, but he’s not based on any one of them. Smart and ruthless, Frankson sees it’s a good time for “a smash and grab” of Ian’s company. That’s the way these things work. So now I had two story lines. In the first, Ian seeks to obtain recognition for his great aunt’s seminal discovery. At the same time he is fending off a predator who’s ready to wolf down his company. In the midst of all this, Ian’s wife, Rowena Goldberg, a deputy district attorney, is trying her first murder case. It’s a frenetic combination of events, but that’s how things work in Silicon Valley. I had the characters and the setting for the book then. All (?!) I needed was a plot. Where would that come from? I waited for inspiration to strike. And then it did. And I love the cover of the book.